To create on Flickr based application you need API Key from Flickr. You can apply for API key here . You need to fill the required information and click on Submit button to create API key. We need this API key in application. You need to submit App information in order to generate key. After submitting app information you will be navigated to App Garden and there you will find APP key and secret key as given in below image. Very first create a Windows Store Application by choosing blank App template. Let us start with initializing variable. To search photos Flickr provides us REST end point. Globally we are initializing Flickr app key we created in previous step and constructing an URL to search on Flickr with search parameter. We are appending app key and search text in URL. Now switch to MainPage.xaml to design application. Very first let us divide content Grid in three rows. In second row we will put text box and button to search Flickr and in third row images returned will be displayed. First row contains header message of application. Creating TextBlock in first to display application header message. Creating StackPanel in second row with orientation horizontal. In StackPanel creating TextBlock to get user input to search Flickr. 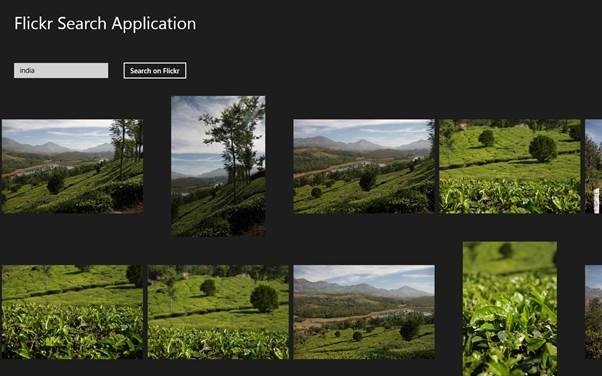 Creating a Button in StackPanel to get user input to search on Flickr. Now let us create output GridView in third row. In this GridView we will display returned images from Flickr. In GridView we are creating ItemTamplate and putting an Image control in that. Image control is been bind to ImageUrl property. We will create class containing this property in later steps. On click event of button we need to make a call to Flickr and get the response. To call Flickr REST API we are using HttpClient. We are making async call to get the response from Flickr. After getting reponse ParseIamges function is called to parse the response. We will parse response using LINQ to XML. After parsing response is set as ItemSource of output GridView. Now let us go ahead and run application. We should able to search Flickr for images. In constructor of the page create instance of DataTransferManager and add event for DataRequested. Now we need to write code in DataRequested event to share text from application. In below code we are creating instance of DataRequest and setting Title , Description and Data to share. Now go ahead and run the application. You should able to search photo from Flickr and share them using the apps. Below find full source code of above discussion. 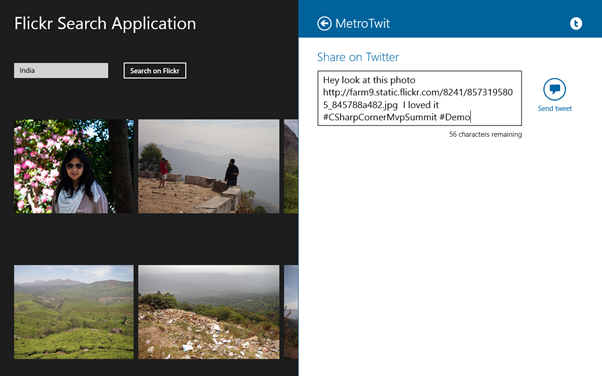 In this way we can create a Flickr Photo Search App for Windows Store. I hope you find this post useful. Thanks for reading.